Are you yet away from travel app development? Well, we have some serious stories to tell, when it comes to your travel business. Say an avid traveler is planning a holiday in Hawaii during the summers. Trust me travel freaks like him will be busy setting up their itineraries. Passport renewal to baggage management and expedite services all are on high call. Taking a sip of Blue Hawaii, while relaxing on the beach recliner by the Pacific – that sounds like a Hawaiian dream come true. However, your business in Hawaii needs to be ready no matter whether it is summer or winter. Just to give the tourist the best Hawaiian treat ever. So, what if an app comes to your rescue? WALAH! That sounds like a savior. There are travel business owners who are trying to tap seasonal tourists and guest on business trips year round. And managing the chain of tourist request is a daunting task. But with the rise of the mobile, tough things seems to fall in place. And some travel business owners have invested in travel mobile app development, and they saw some great changes. 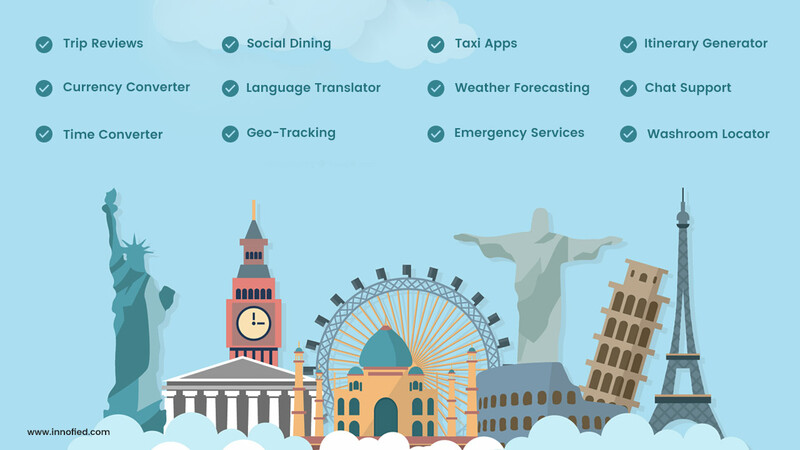 A travel industry can see scope in travel app development in a number of areas. Such as travel agencies, tourist transportation, destination apps, event businesses, local or sightseeing operations. But is just having or leveraging your work to a travel app development company is the only solution? Nah! Being a serious business owner you need to think about the features that are must for your travel app. Say you are going to make a travel guide app. What steps will you take? Open the Google, go to the search and type in “how to make a good travel guide app?” What you get is 100’s of suggestion, advice, and companies who appear in SERP and entices you. But you grab on something that discusses the must-have features to make a good travel guide app. And with that thought, I penned down the exclusive features that make your travel app easily spotted in the crowd. No doubt, travel and tourism sector is a great industry. And travel app developers have yet untapped the market. But the point that most companies seem to miss out, in general, is what features your travel app must have to rank among others? With India’s TripHobo or the world famous TripAdvisor getting travel things right. Even scoring a funding of over $1 million, what are the features that can make your travel app a hit? Even with the rise of on-demand travel apps like Airbnb, travel app development industry is feeling the new lease of hope! Let’s chuck out everything, and see what can make your travel app the best in town! This is the most important feature demanded by travel enthusiasts or tourists. What makes it so special? An efficient itinerary generator only asks the user to mention the locations that they want to visit and automatically creates a travel plan from it. Take a look at services like TripHobo, that lets users add existing tourist attractions or even add custom landmarks to generate their trip plan accordingly. Implementing such complex algorithms is not easy. But if you want to make your travel app a successful, then ask your travel app developers to work on it right on! A vital goal for hitting the gold mine in travel app development comes from the successful integration of GPS based location services. After dropping at a certain destination the first thing that a tourist wants to check out is a hotel, cafe or a nearby local attraction. Your travel app should get a GPS lock, track your location and quickly fetch results. Mobile apps such as RunGo does a fine job of searching nearby locations for all kinds of services a tourist can avail while on a trip. A lot of tourists book their flights in haste not thinking about the ramifications that a climate change can bring on an unplanned journey. To prevent such calamities travel mobile app development companies should always integrate a real-time climate forecast. Just to alert the traveler of upcoming weather predictions, when they are creating their travel itinerary. To get an idea of what I am talking about, check out apps like AccuWeather, that displays weather reports for a vast number of locations all over the world. It let users check cloud formation patterns, wind speed, humidity and several other important factors before planning trips. Now, this is one heck of a tricky feature to implement but if you can get it working, your travel app will be an instant favorite. In most cases, travelers are not too familiar with a regional language and suffer while trying to communicate in a broken manner. Apps like Google Translate and iTranslate let travelers scan texts for visual translation, translate real-time voice data and written text as well. Travel app development companies should definitely take this feature seriously if they want to stand out and offer a unique pitch for their app. Think from a tourist’s perspective. You are on a trip and need to exchange some currencies. To know the currency exchange rates you shouldn’t need to look beyond your travel app. Travel app developers should take a cue from apps such as XE Currency, that tracks all the current and past variations in currency rates, and integrate this feature into their travel app. Crossing time zones can cause a lot of confusion for tourists, in the matter of tracking the exact changes in clock times. It is a simple feature for a travel app to have one. As that can prevent a person from installing yet another. Travel app developers should take a page from the book of apps such as Time Buddy that saves the users valuable time (pun intended) by calculating the correct clock times for different time zones across the world. An emergency situation can come up irrespective of specific time and location. Every travel app development initiative should remember to include emergency phone number and services (based on the current location) feed to make sure that travelers can access them whenever a need arises. Even one can develop travel apps like Waze, which is a local traffic guide and informs users of the shortest route without traffic to the destination. Whether you need to travel from the airport to your hotel or perhaps to a certain tourist attraction, cab service is one of the most important parts of a trip. If you hire a travel app development company, then your product must come with this feature integrated within. Want to build an UBER like taxi app solution? Plus, if you look at it as a source of extra income, Uber pays you a steady amount per user referred ($5 per passenger, in the USA), which is a great idea for a successful business model. In many cases, travelers prefer an authentic experience to the same old living in a hotel. Dining in the chef’s house while listening to the tales of the land is a much more fascinating than the same old restaurant dining. This new concept is gaining massive popularity and services like EatWith are taking it to a new level. If you are developing a travel app, you must definitely try to leverage this feature. Ever been out on the road unable to find a washroom or loo? You’re not the only one. Thousands of tourists face this situation and have to suffer through it. While developing a travel app or website, this is a key offering to install within your product. 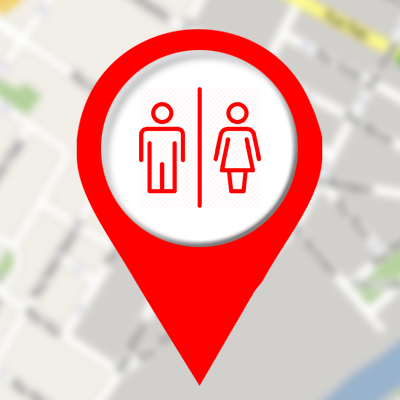 Apps like Toilet Finder or SitOrSquat have received immense popularity among travelers and the general population in finding them a restroom in case of emergencies. A major part of travel app development lies in social media integration. Real-time social feeds like Twitter and Facebook let tourists interact with their friends and following by sharing snapshots, experiences and also letting them know where they are. The whole reason that made apps like TripAdvisor gain a viral fan following was that of its review system. Tourists should be able to review a place and share their experiences with other tourists. This will help create awareness and also help better the services of hotels, cafes and other businesses. Rather than making people download other apps, travel app developers should just add these features into their products. Do You Need a Travel App Development If You Have a Website? Well, building a dedicated travel mobile app can drive you 130% more traffic and conversion than the mobile websites. Prior to that, you need to consider what your user wants before you build one app. With mobile becoming the widely used device compared to other technologies available online – missing on building a mobile app can be a perfect way out. Are you sure about the target audience and what they want from the travel app? Try to do your homework and include these things in your app. Research the competitors to find out what are they doing and what features that you can include. Be a pro and use the free data provided by other travel apps. You need to hire travel app developers who not only be professional but share your passion and beliefs. The delivery team should be able to define the concept depending on the market trends, milestones etc. Bonus Read: How to Hire Travel App Developers? Look inside the possible option of monetizing your app which ultimately will help you earn money from the app. This might include – in-app advertising, commissions for direct traffic, in-built purchases or subscriptions. Editor’s Note: This post was originally published on Oct 2, 2015, and has been updated for accuracy and comprehensiveness.